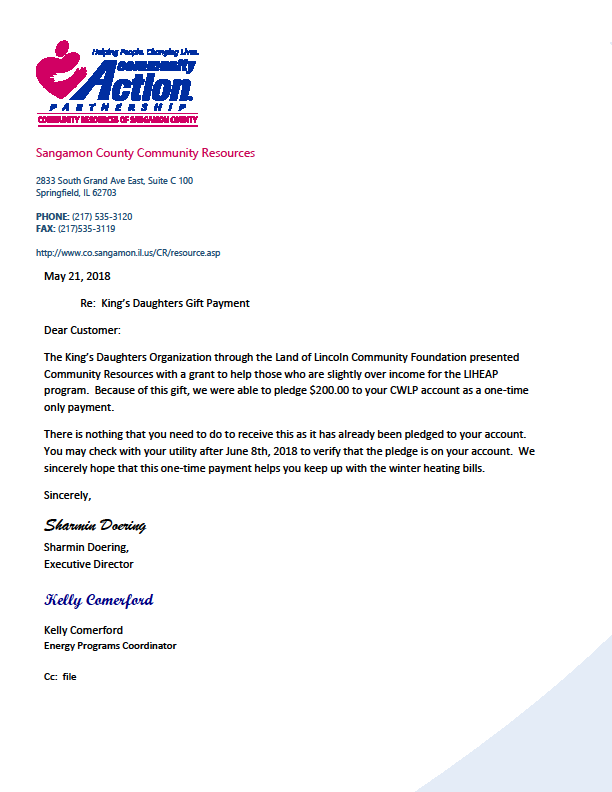 With the help of the Kings Daughters grant funding, Sangamon Community Resources has been able to assist over 50 elderly customers so far this year with utility assistance. Customers 60 years and older who often do not qualify for Low Income Home Energy Assistance Program (LIHEAP) now can receive utility assistance. These elderly customers are often slightly over-income for LIHEAP qualifications but are still considered low income. Sangamon County Resources offers a $200 payment per customer made directly to their utility vendor. These elderly customers did not have to decide whether to pay their utility bill vs. buying groceries or medicine. In addition, due to the flexibility of the grant, the agency was able to assist with either gas or electric utilities. The customers who received assistance were beyond thankful for the help they received. Several made calls and others wrote letters to the agency. The King’s Daughters Grant has made a huge impact on the recipients of this program and these funds will continue to be dispersed honoring the mission of the King’s Daughters Organization: to serve seniors in Sangamon County.